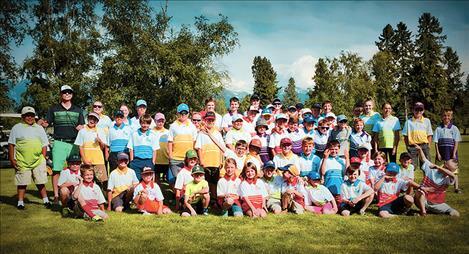 Cameron Milton poses with his PGA Jr. League participants. News from Alday Communications, Inc.
Milton has grown his PGA Jr. League program from one team to six teams of 72 boys and girls in just four seasons by relying on word of mouth in Polson's town of 5,000 people. His passion for junior golf and his commitment to including kids of all backgrounds and abilities will be highlighted in the feature.